This collaborative project was a national writing competition with Willow Burn Hospice, County Durham. It was inspired by Rachel’s online radio play Benchmark, a drama which centres around the ‘In Loving Memory’ plaques found on benches which are usually situated in a place of beauty or special significance to those commemorated. However, the aim of this competition was to celebrate the living and to treasure life. 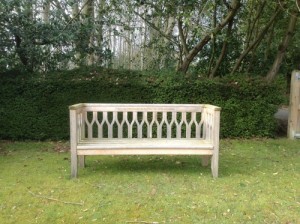 FIRST PRIZE: A hardwood bench with personalised plaque donated by Faithful & Gould, Victory Signs and Solid Oak Hardwood Furniture. In addition to raising funds of £150, the competition also raised the profile and awareness of Willow Burn Hospice and their work; it also encouraged entrants to reflect differently and positively about their lives. There were 76 entries in total from Scotland to Cornwall with chosen places for bench locations from Tynemouth to Turkey and beyond. After assessment by a team of pre-readers, the final ten entries were judged by Bishop Auckland Writer Wendy Robertson, Head of Clinical Services and Writer Sue Spencer and Dr Philip Le Dune, a GP with an interest in palliative care. We all the enjoyed the beautiful rich descriptions, many of these places had been shared across the generations. Thank you to everyone who supported the competition – you can read the winning entries below. What would it say about you on the plaque? Dedicated to Maggie, who always sees the far shore and tries to walk over rocks and swim against the tide to reach it. Looking out to sea at Holy Island, Northumberland. It’s the light that makes the honeycombed sand shine, paints the priory’s stone pink and, from the mainland on sunny days, transforms cars into a convoy of glinting crystal under the castle’s walls. For me, Holy Island is a place of memories. As I sip the mead in St Aidan’s winery or tread in the sand prints of ancient monks, I remember the little girl who walked with her father by upturned boats and lobster pots, after crossing the deserted 1960s pre-road causeway. Our family’s links with the island go much further back, to the 1840s when my three times great aunt took her vision and young family to build a home in its remote wilderness, but was swamped by the struggle following her husband ‘s loss on a desperate winter day. Happy or sad, like the pull of the tide, I’m always drawn to return for the great sweep of sea and sky, blushing in teen touch or clashing in thunderous combat, as well as the island’s unique blend of salt air and sweet liquor for the soul. Fiona was born to sit on benches, find beauty in every view. Sometimes she writes about it. People are drawn to her, tell their stories. She gathers them like diamonds. Glenesk, rocks softened by water, moulded into sleepy moors and hills. Glenesk, place of the rowans. I first came here, carried by my mother, photographed by my father, grew into the twists and turns of this no through road that brings me here today, to the river rattling stones on its way east to the sea. Around this steep bend, it’s 1963. My sister and I collect pine cones, Dad finds bark. Back home he’ll burn it, make glaze for his pots. Mum pulls the cork stopper from the Thermos, pours tea. We find a space between the ferns, sit and watch red deer hold our stare, turn and disappear. Heather moors hold up a blue sky. A kestrel shimmers, is gone. I brought the man I would marry to where the road ends. We climbed until we saw icicles, watched tadpoles shadow grey beneath frozen water. My hand in his, we warmed to each other. From this bench, I watched my children grow with each Sunday outing, curl into sleep as the sun’s embers set. Look – rabbits, I tell my grand-daughter, as my son carries her into the view. As I arrive in the little town of Kas from the height of the mountain road, the sea of the Lycian Way below glitters in a rapture of welcoming applause. I have to take a deep breath or I might start applauding back and wake the sleepy locals on this bus. It’s 6.30am Turkish time. Only hours ago I was wheeling a very “un-me” garish pink suitcase along a grey, London street. An underground ride (with some unexpected tears on my husband’s shoulder), a plane and two buses later and I’m looking at the most beautiful thing I’ve seen. I wonder about creation for a moment. I don’t think this could be an accident. I’m fizzing with excitement and the privilege of swimming in this sparkling, indigo sea. It was a dull day in the office when I signed up to the challenge – one of those spontaneous, online moments when with the click of a mouse you’ve committed yourself to something. Again. Warm days of coastal swimming and a five kilometre crossing to Greece now awaits me. I’m nervous but I’ve trained well – my lungs feel big and my shoulders strong.